With unsettling beauty and intelligence, this Golden Man Booker Prize–winning novel traces the intersection of four damaged lives in an abandoned Italian villa at the end of World War II. The nurse Hana, exhausted by death, obsessively tends to her last surviving patient. Caravaggio, the thief, tries to reimagine who he is, now that his hands are hopelessly maimed. The Indian sapper Kip searches for hidden bombs in a landscape where nothing is safe but himself. And at the center of his labyrinth lies the English patient, nameless and hideously burned, a man who is both a riddle and a provocation to his companions—and whose memories of suffering, rescue, and betrayal illuminate this book like flashes of heat lightning. MICHAEL ONDAATJE is the author of six previous novels, a memoir, a nonfiction book on film, and several books of poetry. 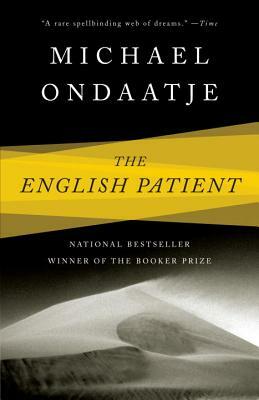 The English Patient won the Booker Prize and subsequently the Golden Man Booker Prize, given in honor of the Prize's 50th anniversary; Anil's Ghost won the Irish Times International Fiction Prize, the Giller Prize, and the Prix Médicis. Born in Sri Lanka, Michael Ondaatje now lives in Toronto.